The FAA will discontinue the use of the dedicated Flight Watch radio frequency 122.0 MHz on Sept.24, a week earlier than previously announced. Crosswind landings get all the glory when student pilots, pilots, and instructors share ideas about training techniques. But crosswind takeoffs are no less demanding. Flying west from Colorado Springs, pilots can explore the breathtaking scenery of the Front Range while learning valuable lessons in density altitude, weather, and flight planning. Sporty’s Eastern Cincinnati Aviation, in partnership with the Clermont Sun, is hosting its annual Bluegrass Concert at the Clermont County Airport on Labor Day, Monday, September 5. The free concert featuring the Comet Bluegrass All Stars will begin at 6:30pm with a second set scheduled to begin at 8pm. 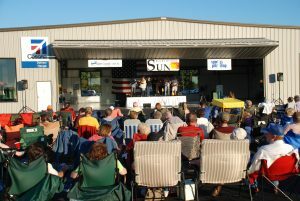 Bring your lawn chairs, picnic basket and coolers with the entire family for a free evening of delightful music and fun. From State Route, 32, take the Olive Branch Stonelick exit and follow the airport signs.